Learn how to help your child with anxiety. Anxiety disorders know no age, gender or life stage. Anxiety can affect anyone, and children are not excluded from anxiety’s grip.Child stress is common. It causes extreme fear and overwhelming worry, and can cause significant and worrisome changes in a child’s behavior and mood. It can even affect their eating habits, and disrupt sleep. When Cathy, mom to 10-year-old Alexa, was called to the school, she didn’t know what to expect. The principal had explained that during a class, in which they were celebrating another child’s birthday, that Alexa had grown agitated. By the time they had lit the candle and started singing Happy Birthday, Alexa was in a fit of tears. “Alexa said that she was worried there was going to be a fire (because of the candle),” explains Cathy. “On top of that, she complained that everyone singing was too noisy and it was really upsetting her. We could barely convince her to come out of the corner. She was sitting against the wall with her hands over her ears, screaming about a fire and the noise. 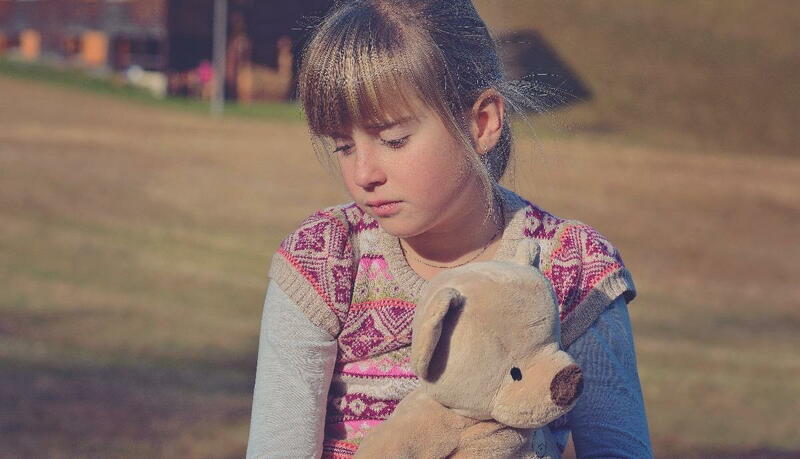 There are a number of anxiety disorders common in children, including Generalized Anxiety Disorder (GAD), Separation Anxiety Disorder (SAD), social phobia (otherwise known as social anxiety disorder), selective mutism (SM), and other phobias. Generalized Anxiety Disorder. GAD causes children to worry over excessively over things that kids without GAD worry about too, like homework and friendships and responsibilities. The difference is that kids with GAD worry way more about those things than usual. They also have anxiety over things that some parents feel they shouldn’t worry about, like who they’re sitting at lunch with, if they’ll get picked last at gym class, or if they’re going to get invited to birthday parties. They also worry about bigger, scarier things, like crime, war, the weather, and the future, as well as what might happen to people they love. Kids with GAD can have a really hard time at school, or they might keep everything inside because they’re worried about what an adult might think. Separation Anxiety Disorder. When babies or very young kids are apart from their parents, it’s normal for them to feel apprehension until Mom or Dad get back home. Over time, though, most kids grow accustomed to this and learn to enjoy their time at daycare, with a babysitter, or with Grandma. But sometimes, that apprehension just won’t seem to go away. When kids don’t outgrow this nervousness or fear of being away from their parents, they may have Separation Anxiety Disorder. Kids with SAD might miss days from school so they can stay home with Mom or Dad, or they might feel too upset or physically ill to leave the house. Kids with GAD may resist going to sleepovers or parties. They have to always see or hear their parent to feel safe. Social phobias. Social phobias cause kids to feel scared to speak up, or even say anything, at any kind of social gathering, whether it’s at a party or on the schoolyard. They think people will think they’re strange. Kids with social phobias will rarely speak during class, and have anxiety joining a group for a class project. They might complain of feeling sick so that they have to stay home. Kids with social phobias sometimes report feeling dizzy, shaky, lightheaded, unable to breathe or weak. Selective mutism is a severe form of social phobia – kids with SM refuse to talk at all in public, only speaking at home and to people they’re comfortable with and love. Other phobias. Everyone has dislikes and fears, but if a child has a phobia – an intense, extreme and long lasting fear of something – that’s classified as having an anxiety disorder. Some kids have phobias of spiders, the dark, monsters, or storms. It can be very overwhelming for children to be dealing with anxiety, and it’s important that the adults in a child's life know how to help them relieve some of that stress. When a child is anxious about anything, from friendships to school, these tips can help. How do I help a child with anxiety? 1) Deep breathing. Kids who suffer from anxiety benefit greatly from calm breathing, which is a technique that teaches the child to slow down his or her breathing when experiencing high levels of stress. When anyone is anxious, their breathing patterns change, and the same is true for children. During moments of panic, anxiety or stress, a child will take short, shallow breaths, which could lead to hyperventilation, causing the anxiety to get worse. 1. Take a slow breath in through the nose and hold it for four to five seconds. 2. Hold your breath for two seconds. 3. Exhale slowly through the mouth, counting to four. 4. Wait two to three seconds before taking another breath. 5. Repeat five to ten times. It’s a good idea to talk to your child about what calm breathing is and how it can help. It’s a good idea to practice this with your child until he or she becomes comfortable. Practicing calm breathing by doing it for 10 breaths in a row is a good start. It’s also beneficial to practice calm breathing not when your child is already anxious, but when he or she is calm and relaxed. This way, by the time they have to apply it (during a stressful situation), they know what to do and it comes easily to them. Teaching a child calm breathing during an episode of anxiety is much more difficult and the practice might even overwhelm them. 1. Close your eyes, breathing in deeply through your nose. Count to three, and then let your breath out like you’re sighing. 2. Pay attention to the muscles in your face, and relax each one, starting with the jaw. Relax your shoulders. Feel your tummy by putting both hands on top of your belly button, and breathe in and out deeply. Notice your belly rising and falling. Repeat 10 times. 3. Stretch your arms way up high and as far back as you can. Then let them drop. Reach for the ceiling, and stretch higher. Keep stretching until you can’t go anymore, and then let your arms drop again, as fast as they’ll go. 4. Pretend you have a hard piece of candy in your mouth and bite as hard as you can. Then relax your jaw. Repeat four times. You should begin to feel the tension star to melt away from your face. 5. Scrunch up your nose and your eyes as tight as you can, and then relax. Scrunch up tight, then relax. Do this four times, and be aware of how relaxed your face now feels. 6. Next, on to your belly. Squeeze your stomach in as tight as possible, and hold for five seconds. Relax. Squeeze in again for five seconds, then relax. Every time you relax, pay attention to how good that feels. 7. On to your legs and feet! You’re going to pretend you’re standing on sand, and you’re going to squeeze your toes into the sand, using all your muscles to do so. Then relax your legs. Pretend the ocean is washing away the sand from your toes as you relax. Do it again – squeeze the sand between your toes, tightening your leg muscles, and then let go. 8. Finally, let your whole body go limp. Enjoy the feeling of being completely and totally relaxed. Try to enjoy this feeling for up to three minutes. After this exercise, ask your child how he or she feels. Ask him or her if they feel good being so relaxed. Now they know the trick to releasing tension. Another quick trick is to provide your child with a stress ball that they can carry around anywhere. When they’re feeling anxious, they can reach for the stress ball and squeeze it as tight as they can, then release it. Have them pay attention to how it feels to relax, to let go. They can repeat that process as often as they like, or until they feel tension relief. 3) Write and tear. Many mental health professionals use this method, which is designed to help a child break the cycle of worry. The child writes down his or her fears, or what’s bothering them, and once they’ve written it and read it, they tear up the sheet of paper. This helps the child let go of the fear, because tearing the paper represents tearing up the worry and throwing it away. Experts believe that the act of throwing away a fear – treating it as a physical object that can be discarded – is a powerful way to overcome anxiety. 4) Keep a worry jar. The worry jar is a popular technique, especially for kids who suffer from anxiety. It’s similar to the write-and-tear method. Your child can write his or her worries down on small slips of paper, slipping them into a jar or some other container. The child returns to this jar a few weeks later, and is invited to look through those worries again. The idea is that several of those pieces of paper will likely contain worries that no longer exist or have passed. The child, knowing he or she is alive, well and healthy, can then take those worries that no longer matter and throw them away. The child can repeat this practice with new worries. 5) Remind your child, “I will always be here.” Of all the methods listed here, this is the most valuable, the most important, and the most poignant. Reminding your child he or she is loved is the most loving thing you can do as a parent or guardian. Saying “I love you,” and “you matter,” are things that a child will never tire of hearing. He or she might roll their eyes, dismiss you, or pretend they haven’t heard you – but they hear you loud and clear. For any child, but particularly those with anxiety, they can never hear enough how much we love them. Raise your child to have no question about the extent of your love for them, and tell them every day that they are wonderful, respected, and valued. If your child is experiencing symptoms of anxiety and you’d like further guidance on how to help, visit www.hopetherapyandwellness.com.